Model 5148A for repair welding of unibodies in compliance with automakers' approved repair procedures. Self-contained eliminates cumbersome oldstyle remote timer box. Meets military specifications for autobody repair spotwelders. Duplicates OEM-Type welds on HSLA, HSS and conventional mild steels. 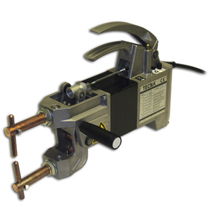 Eliminates "Repair Job Look" of other welding processes. Small heat zone eliminates metal warping. Automatic Surface Condition Compensation - Self -compensating for dirty or slightly rusted material. Tight clearance arms for pinch weld areas and quarter panels. Swivel tip, used for minimum marking on door skins. Use with set part #7501. General purpose use. Exposed pinch weld areas. Radiator supports, door openings and skins. For fender wells and other flanges. Long reach arms. For floor pan and quarter panel.